Also known as ‘Summer Flounder’ this popular fish is a staple of Vineyard waters despite the fact it can be found as far south as North Carolina. The Fluke has the ability to camouflage itself by changing the color and pattern of their dark side to match their surroundings. Fluke mature relatively quickly and often reach sizes of 26 pounds with a lifespan of nearly 20 years. Known locally as ‘Dormats’ for their massive size, Fluke is a fun and easy fish to catch and makes for a delicious meal. Fluke has a light, firm, mild tasting white meat that is perfect breaded, fired, with some lemon juice. Menemsha Charter fishing captain Scott McDowell can always find the fluke! Who wouldn’t want to catch and cook their own locally caught dinner? The perfect highlight to any Marthas Vineyard vacation. Book a North Shore Charter today and make this dream a reality. 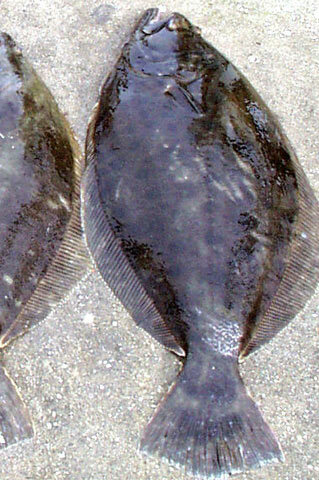 The summer flounder or fluke is the most important species of flounder of the Atlantic coast. Along with Bass, Bluefish, and Tuna, it provides a huge portion of the commercial and recreational fishing industries on the Atlantic coast. It is no wonder that this highly sought after fish is a favorite catch for North Shore Charter patrons. The Summer Flounder is often considered a fun family fish due to its desirable meat and wide availability. Thanks to its wide popularity, the fluke population is regulated by state governments in order to preserve this valuable resource. Menemsha Charter fisherman like Capt. McDowell knows the value of fluke as one of the most fun and delicious recreational vineyard fish. Spend the day on Marthas Vineyard Charter Fishing Boat the “Lauren C” and connect with this piece of island natural history. Catching and eating fluke is a vineyard pastime that you and your family soon won’t forget. Check out the Copperworks Online Store for copper sculptures of the Bass, Bluefish, and Tuna, and other Vineyard Fish you are likely to encounter on a North Shore Charter.